Oakshire Brewing brewmaster Matt Van Wyck was at Belmont Station yesterday to promote the brewery's third Brewers' Reserve beer: a tart blended ale called Skookumchuck, which is available in a very limited number of corked and caged 750 ml bottles. Skookumchuck is mildly tart -- it won't make you pucker -- with an aroma and flavor much like lighter Belgian geuzes. It's fairly malty but not cloying, with a little dusty wood in the finish. 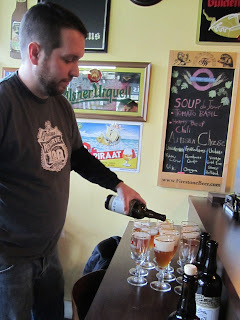 The three base beers were aged in wine barrels for varying lengths of time before blending: a 2009 strong Belgian golden ale was aged with Drie Fonteinen's strain of brettanomyces; a 2010 saison got a dose of La Folie's brett and aged on apricots and plums; the third beer was a 2009 lactobacillus-spiked Berliner weiss that was thrown into a barrel when it didn't work out as a fresh beer. The beers themselves wouldn't point toward such a close approximation of a Belgian geuze, but I suppose the brettanomyces and the barrels contributed a lot toward the flavor. You might be wondering what the first two Brewers' Reserve beers were. They were released stealthily earlier this year, and are now apparently gone. Green Power Pale Ale was available on draft only, and a Märzen called Land Trust Lager also came out in bombers. The three beers were a collaboration with the Eugene Water and Electric Board, to commemorate EWEB's 100th anniversary, and all profits from them are donated to the McKenzie River Trust, the source of Eugene's city water. The beer names were chosen from suggestions by EWEB employees -- "Skookumchuck" is a Chinook word for river rapids, but the literal meaning of "strong waters" is a nice double entendre for a strongly-flavored beer. Going forward, the Brewers' Reserve line will mostly be blended barrel-aged beers like Skookumchuck, and mostly sold in corked 750s at Oakshire's tasting room. Releases are not on a schedule: not until a barrel is ready, says Matt, though he hinted that he has a framboise in the works. Brewpublic has a nice post by Matt talking about the philosophy behind Oakshire's barrel-aging projects. Speaking of which, Belmont also had Oakshire's Hellshire II on tap yesterday. Hellshire II is a bourbon-barrel aged imperial stout with coffee. 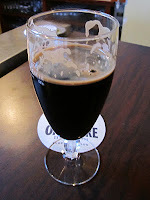 (To digress for a second, whenever you're looking for a coffee stout, my favorite for the last few months has been Oakshire's Overcast Espresso Stout, especially when it's fresh on tap. Best of all, it's widely available in Oregon on tap and in bombers.) Planned for an annual release each winter, the Hellshires are strong ales aged in spirits barrels -- so far just bourbon barrels, but Matt said that they have various other barrels going also. Hellshire bottles are bottle-conditioned and sold in wife-proofed wax-dipped bottles. 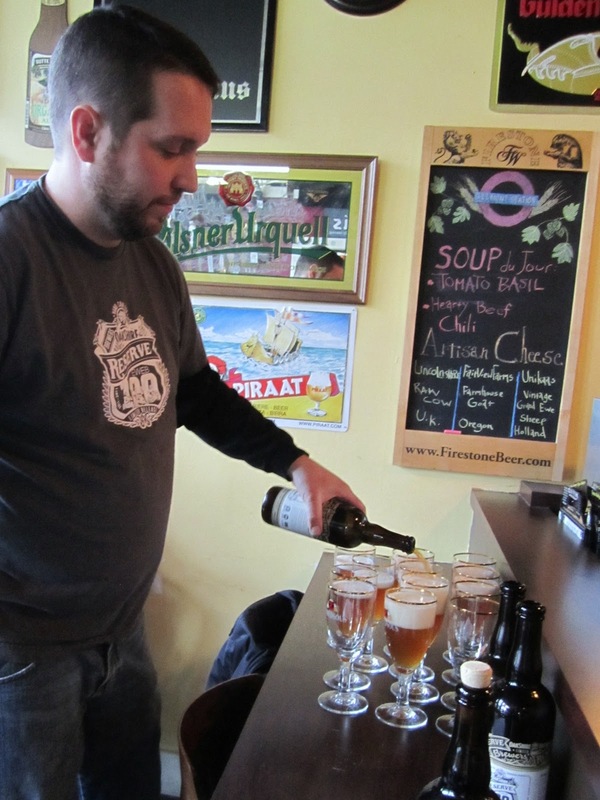 Last year's Hellshire I barleywine was somewhat coolly received by the rare beer crowd that had been eagerly awaiting it based on their fondness for the annual Wooden Hell barleywine that Matt did when he was the brewmaster at Chicago's Flossmoor Station. I thought the negative reaction was overblown, it's a nice solid beer. I've got one on hold in the basement right now. At the Skookumchuck tasting yesterday, I expressed the opinion that its mild tartness is more in line with Belgian wild ales than most American-made sour beers are. American sours -- even ones that I like, such as Cascade's cherry-infused ones -- tend to be so over the top that they can be a challenge to get through. To test my point, I cracked a bottle of Lindeman's Cuvée René Gueze to try alongside the Skook' (that's the beauty of holding beer events at a bottle shop). While the Lindeman's did have the edge in sourness, the difference wasn't huge. Matt said they were far closer than he would have guessed. The Oakshire was definitely maltier, making me think that one difference might be extra drying-out time by the Lindeman's. As you can see, the Lindeman's was much clearer, and had a touch of vinegar flavor that I don't remember from last time I tried it, but which is completely absent from the Skookumchuck. Verdict: the Oakshire was not as sour, was sweeter and overall more approachable, but with many of the nice flavors and aromas you get from the Lindeman's. Nice write-up. 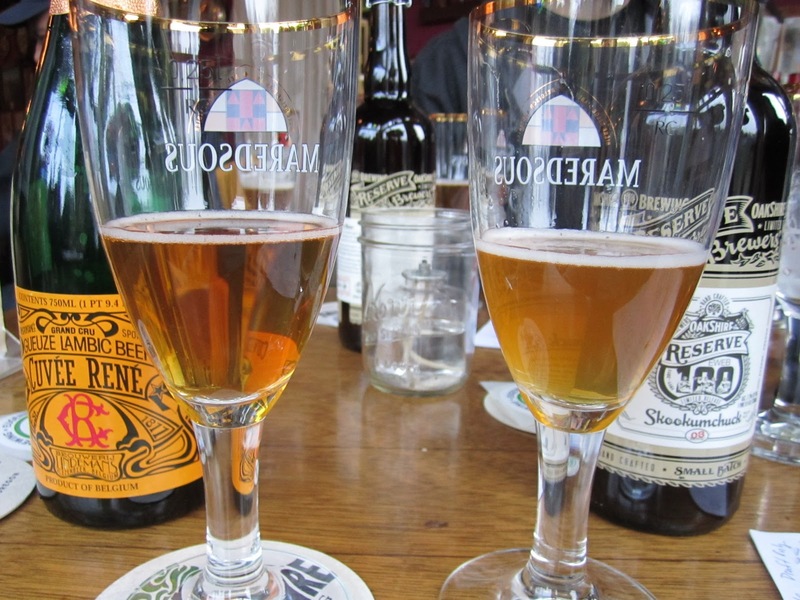 Barrel-aged, tart beers seem to be trending at the moment. Everyone wants in the game. Clearly, not everyone is going to do this well out of the gate. Results are going to be mixed. I definitely agree that some of the Cascade beers are over-the-top sour. I prefer beers that are mildly tart, such as Barrel 1 at The Commons. Cascade has also offered some terrific mildly tart blends. Hellshire II has a problem. Call it a wild bacterial infection, call it an overabundance of acidity in the bourbon barrels, but the bottle i had was not good. You should give it a try and I think you will see what people are complaining about at 17.00 a pop. I love Oakshire, but that was a miss. @Pete: Thanks for mentioning the Commons, I agree. And the other day at Cascade there was a tart Rye aged on plums that hit a really good place on the tart spectrum. Also I find that Upright's wild beers keep it in check pretty well. @DSR: I'll probably buy a bottle of Hellshire II as a keepsake in case there's some kind of recall, but it will be interesting to see what the lab results say. The glass I had on tap was great. The Skookumchuck rocks. It's that rare sour that can appeal to both big fans of sour beers and those who are, let's say "sour-curious." Round, balanced, complex, but quite approachable. Good stuff. "sour-curious" that's funny. Great write up, I wish I could have been there. Oakshire is putting out some wonderful beers, I just wish I could score them in Colorado and be able to enjoy them more often. Bill, I loaded up (well, all five bottles I found) on Oakshire Overcast Espresso Stout on a recent trip over to Spokane. I remember it well from the live blogging session at BBC11. It was universally praised around our table. One of those beers that you expect to be good, but are pleasantly surprised to find out it far exceeds your expectations. Love those beer finds.